A. Allbright Painting kicked off their first $5,000 giveaway last summer, naming Silvia Aguila of Acton the winner. Aguila's husband Carlos died suddenly of a stroke at age 40 last year. She now works six days a week as a manager at Burger King and raises her two children alone. Over 20 A.Allbright employees and family members came together to give her home a makeover, including exterior and interior paint. 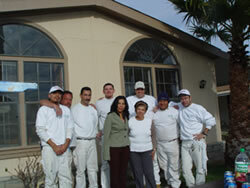 In addition to volunteering their time, the painters also donated a portion of their wages to the struggling family. On Saturday, May 6, The Pilates Pros, located on Smyth Drive in Valencia, will host their grand opening. In celebration of Mother's Day, the studio is offering one free mat class to all moms. The charity-focused company will donate all grand opening proceeds to the National Breast Cancer Association; after May 6, a portion of the cost for all classes or products will also benefit the nonprofit. For more information call the studio at 295-0700. Toasmaster's Day Break meets every second and fourth Thursday of the month at 7 a.m. in the city hall building. For more information, e-mail inspireddoctor@aol.com or call 433-4447. The Santa Clarita Valley Chamber of Commerce Hispanic Committee has announced the First Annual Hispanic Business Expo at the Santa Clarita City Community Center to be held on May 13. The Hispanic Business Expo will showcase both Hispanic business owners and their enterprises and owners of local businesses who want to expand to the Hispanic market. The expo will combine 25 booths located on the main floor of the Community Center as well as food vendors and a main stage with entertainment. The following companies have already signed on: Silpada Designs, Casa Bella Mortgage, Gallardo Property Management, SCV Network Professionals, Advantage Airways, Gold Feather Realty, Dan North of Farmers Insurance, Mary Kay Cosmetics, Victorian Tea Time, Borchetta Marketing, Spanish for Business, Foresters Financial, Mortgage 2000, Girl Scouts, North Star, AV Equipment Rentals and Alianza Mercantil International LLC. For more information contact Mark Borchetta or Jorge Luis Boza at 977-7464. An informal gathering of former and current patients came together to provide hope and cheer to those who's lives have been touched by cancer. Multiple speakers, including the Reverend Philip Abraham (Providence's chaplain), American Cancer Society volunteer and breast cancer survivor Julie Abernathy, former breast cancer patient Judy Jo and educational expert JoAnne Shahnazi OTR/CLT, provided a mixture of inspiration, knowledge and personal experiences for the yellow-clad audience. The event, in celebration of Daffodil Day (hence the yellow-sporting crowd), refl ects a larger national movement sponsored by the American Cancer Society. The suspense finally ended in April for local advertising professionals who entered the first-ever local ADDY® Awards. "All of us in the design field work so hard behind the scenes, so it's nice to be rewarded for our efforts," said Best of Show winner Chris Macabitas, who serves as in-house creative director at Marzochi Performance Suspension Systems. AdPros is an affiliate chapter of the American Advertising Federation (AAF), which administers the ADDY® Awards, considered the world's largest and arguably toughest advertising competition. Each AAF chapter administers a local awards program and the winners advance to one of 14 regional competitions. Regional winners move on to the national/international finals. Formed in January, AdPros is among the newest of the AAF's 210 local affiliate chapters. "We're the premier professional organization for anyone involved with creating, buying or selling advertising," said AdPros President Gary Jacobs, who serves as Creative Director of Jacobs Creative Design. "That includes graphic designers, photographers, printers, ad reps, agency staffers, in-house creative teams, media buyers, copywriters, direct mail companies or any other job that's connected to the industry." Although AdPros is new to Santa Clarita, its members are not. Formerly known as the Graphic Arts Professionals (GAP), they were affiliated for the last 15 years with International Association of Printing House Craftsmen - the Graphic Professionals Resource Network, a group focused on printing services. AdPros serves the Santa Clarita and Antelope Valleys, as well as the northern San Fernando Valley and Agoura, Thousand Oaks and Westlake Village. The group meets at noon on the third Friday of every month at Salt Creek Grille, and visitors are always welcome. 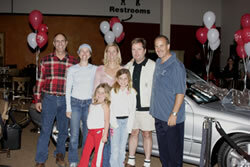 On March 4, longtime Homemakers' customer Shelley O'Brien, was the lucky winner of a new Mercedes. Over 500 people were present for the evening's event. "The turnout was unbelievable!" said Tim Wickman, co-owner of Homemakers. "It's the first Mercedes giveaway in this area and we knew it would set us apart." Out of over 5,000 entrants, 100 were drawn mid-week by Josephine Svedmark of Mercedes Benz of Valencia. Julie Hoffman, co-owner of Homemakers, along with Kevin Malone, owner of the new Mercedes of Valencia dealership, narrowed the 100 contestants to 10 at Saturday's event. Shelley has her husband to thank for picking the winning key. "He was adamant I pick number six, Dodgers Steve Garvey's number, and so I did!" said Shelley. Homemakers' next giveaway is $24,000 worth of Homemakers furniture and accessories. On May 11, Cottage On Walnut will be hosting a celebration of their one year anniversary. Mary Ann Ripper will be their featured artist. Her sculptural art, "Shoe Stories," will be offered through the Cottage, and during the celebration she will also perform "Seriousity Killed the Cat," a piece that Ripper authored. "Shoe Stories" are personalized sculptures using people's shoes. Whether from baby shoes, sport cleats, oxfords, or high heels, these sculptures are one-of-a-kind and are as unique as the owner of the shoe itself. Following the success of a "smart sprinkler" pilot program, Newhall County Water District is offering a rebate program for customers interested in upgrading their current irrigation timer to a new hightech, weather-based system. The district's ET Controller Rebate Program is available to singlefamily homeowners with a minimum of 1,200 square feet of irrigated landscape and a working in-ground irrigation system operated by a working timer/controller. The rebate is $20 per active valve. The maximum amount for each rebate is $240 per residence, not to exceed the cost of the ET Controller. Smart sprinkler systems range from about $200 to $700, which may include installation, and two years of free hook-up to weather stations, depending on the type of controller. After this time, the cost is $48 per year. To apply for the rebate program, or for more information, contact the district at 259-3610 or visit www.ncwd.org.